Dr. Holt uses dental bonding (similar to veneers) to correct gaps, chips, cracks and other cosmetic dental problems. With dental bonding, a white, tooth-colored resin material is applied to your tooth surface and then is hardened with a special light. This will cure the bonding material to your tooth. Dr. Holt is highly skilled in shade selection and can match your existing tooth for a natural look. Dental bonding is a more affordable alternative to other cosmetic dental procedures. The same method is used in creating fillings that blend in with your natural teeth. Your smile says a lot about you. Get the smile you've always wanted at Holt Dental Care! 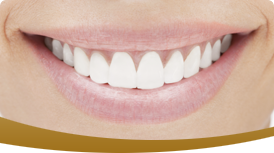 Call us for your free smile consulation. ©2014 Holt Dental Care. Website Design, Website Development & Website Hosting by i5 web works.